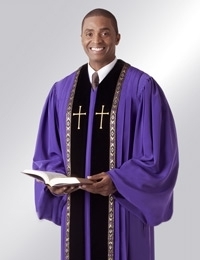 Clergy Robes for Men- Ready to Wear Pulpit Robes, minister robes, pastors robes, preaching robes. Welcome to our large collection of pulpit robes for men. We offer so many clergy attire styles that we've had to group them by type- these are all classic robes, pre-made styles only. You'll find cassocks, jackets and various other clergy apparel on other related pages. Please see the links below, or use the navigation tool at left. The styles on this page are part of our "Qwick-Ship" collection of ready-made tailored apparel for men. These are for purchase only- rental clergy robes are totally different inventory (see link above). Listed prices apply to the Qwick-Ship items pre-made in standard sizes, with NO variation. Sorry, we cannot add monograms or provide other fabrics and colors for Qwick-Ship robes, please ask us about a custom order. Robe ordering FAQ answers most questions, from sizing to order forms, and explains the difference between custom and "Qwick-ship" garments. Coordinated style for women (Evangelist H-157- get a matching husband/wife set! Coordinated style for women (Evangelist H-183- get a matching husband/wife set! Item #GNH-114 $398.90 The John Wesley Black Doctoral Robe for Men. This robe meets academic standards for a doctoral degree, suitable for taking part in a convocation or other collegiate setting. Contact us if you need to rent or purchase an academic doctoral hood and/or tam to match. Coordinated style for women (Evangelist H-157)- get a matching husband/wife set! NEW! Item #GN10155 $89.90 Carryall Garment Bag: Ideal for both travel and storage, our deluxe carryall bag has been designed especially for longer items.